Kerala flood victims are on high priority of govt, and also people across the globe is making enormous donations for the relief camps set near the safe house. But are those donations and charities are enough to take care of Kerala Flood Victims? Or even enough to meet the necessity or needs? There has been a lot of interactions on Social Media suggesting that Kerala flood victims are gaining enough man and material relief but that’s not true. As per India Today; Kerala floods have destroyed more than 50,000 homes partially and around 7000 houses and buildings were completely shattered. More than 500 people are dead, 35-40 people are unfound, and a few thousand are severely injured. A set of relief camps are set and around 10 lakh people are totally dependent on the relief camps. “At least 10 lakh people are currently taking shelter at relief camps across Kerala, which has been ravaged by floods following torrential rains in the state. Food, medicines, and sanitation are still needed a lot”. Sources close to NDTV said. There has been a lot of politically driven decision like rejecting donations from UAE. Requesting central govt to take charge of the situation by releasing funds, which eventually got yesterday. Kids are still mourning for milk and cerelac, elders are waiting for medicines. People still need us. Seruds India is will become a pillar of hope for Kerala Flood victims. With everyone’s support, we can participate enormously. 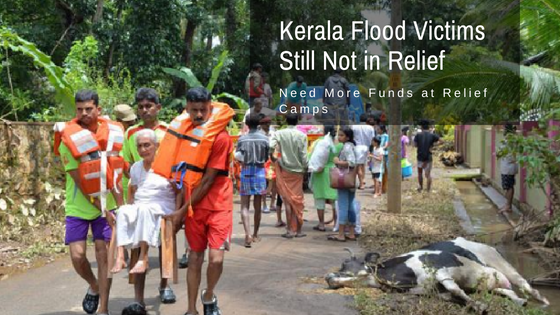 The bottom line is, there’s not much relief for Kerala Flood Victims at Relief Camp. Let’s unite to be a ray of hope for them.